nybarbie1010 has no other items for sale. NEW Cute C.R. 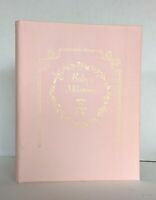 Gibson Blossom Baby Girl 72 Page Memory Book for Newborns 11" x 9"